Press Release posted 1/7/17 – The Sierra Madre Environmental Action Council mourned the loss of their beloved member, Laurie Cooper in 2016. Laurie’s long involvement with SMEAC began just after the formation of the organization in 1971. 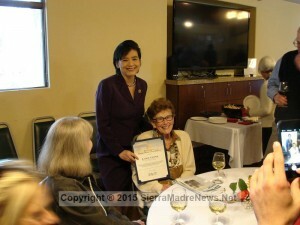 She managed Southern California’s first community recycling center, located in Sierra Vista Park. She also spear-headed SMEAC’s stewardship of Bailey Canyon Wilderness Park, serving for years as a docent and educator of the natural benefits of the park for local elementary school children. An effort began to memorialize Laurie with a bench in her beloved Bailey Canyon Wilderness Park, but after some research, the expense of a durable concrete bench became prohibitive. 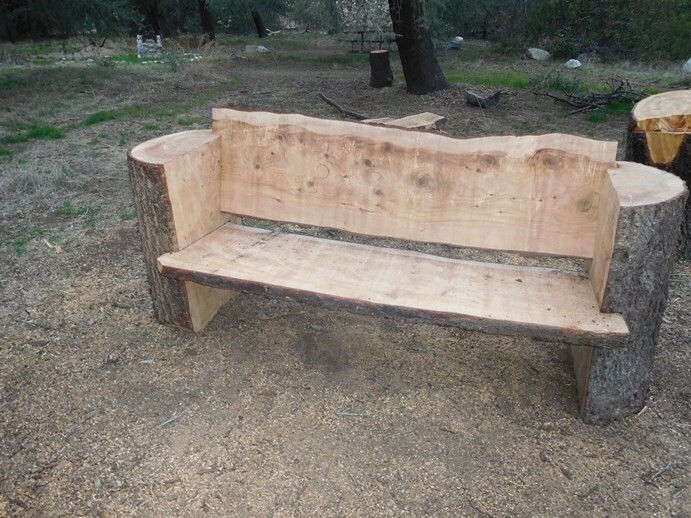 SMEAC President Alison Snow and recently retired Director of Public Works, Bruce Inman came up with the idea of a more natural bench, one that could possibly be simply “notched out” from a recently felled Deodar Cedar tree. The City’s contractor, West Coast Arborist, was approached with this idea. WCA was receptive and enthusiastic with the idea, and has agreed to contribute their time and expertise to the creation of Laurie Cooper Memorial Benches. Work began this week, and is expected to be completed shortly after the rains. The current plan is to create a large bench and a smaller bench for children to rest in the beautiful scenery of the park after a nice hike. The large bench is pretty much completed, and the end product is emerging to be beautiful beyond anyone’s expectations. It turned out that WCA sent their employees, including John Mahony and his partner, who are renowned in the state for their chainsaw art. City Staff is overwhelmed with the creativity and beauty of this work, and is very happy that such a wonderful memorial will be constructed for such an important decades-long volunteer.